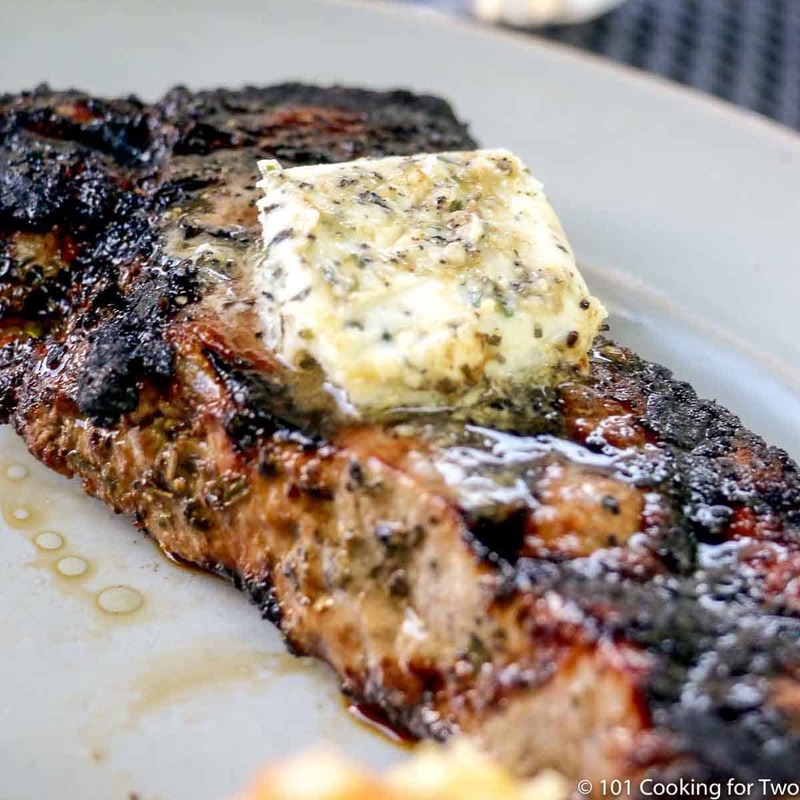 Make that steak pop with this wonderful blue cheese and garlic compound butter. 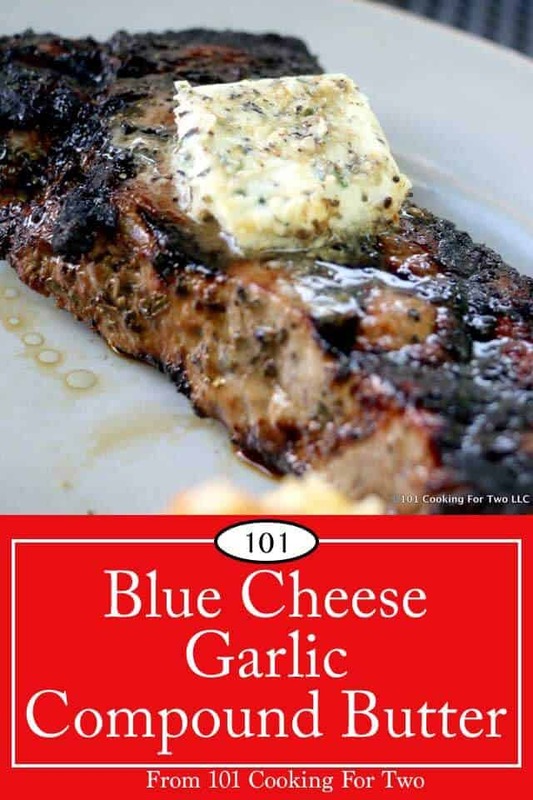 Add layers of butter, garlic, and blue cheese to make the meal extra special. There are as many compound butter recipes as there are people. Well almost. But some basics. First I use regular salted butter softened a little be setting at room temperature or softened slightly in the microwave. If you use unsalted butter, you should add a little salt. Second basic, there are no more rules. Now comes the fun. You can add almost anything you think would be good: Garlic, fresh herbs, shallots, scallions, spices, zest from fruits, cheeses, but mostly anything you want. Now I think the combination I have here is exceptionally good, and my wife has made me repeat it twice. 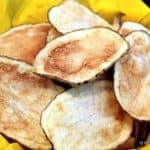 An excellent addition to a steak, veggies or even a baked potato. OK, I can’t survive on this alone, but you get the idea. A little goes long ways. Think of a stick of butter. That is 1/2 cup or 8 tablespoons before adding anything. Here I add approximately an equal amount of blue cheese crumbles. It is a little less due to the air space in the cheese. But maybe 12-14 servings of 1 tablespoons and that is a good chunk of butter to me. Allow one stick ( 1/2 cup) butter to come to room temperature. You can speed that up some with the microwave. Combine with 1/2 cup blue cheese crumbles. One tablespoon fresh chopped parsley, one teaspoon dry basil and two cloves crushed garlic. 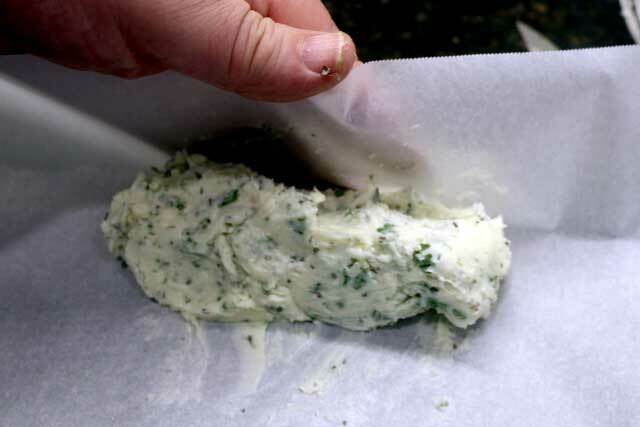 Form into a roll in parchment paper and allow to firm up in a refrigerator for 1-2 hours before serving. 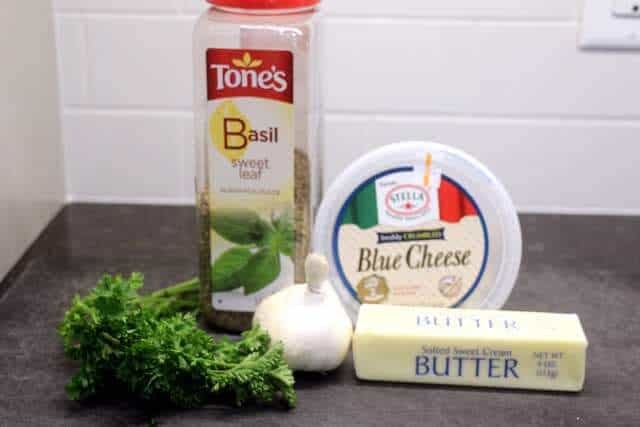 This wonderful blue cheese and garlic compound butter will add layers of butter, garlic, and blue cheese to make the meal extra special. For Christmas dinner, we decided to step outside the box, but only a little bit, and grill steaks for our main dish. We found beautiful steaks on sale and I liked the fact that The Hubs can do the grilling, while I take care of the side dishes, instead of me doing it all. 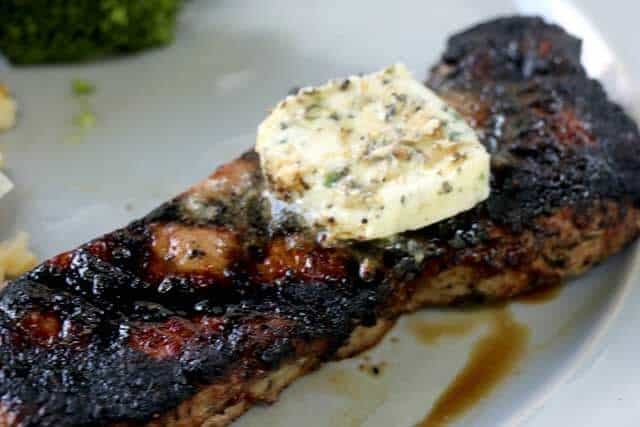 To make these steaks extra special for Christmas, I made this compound butter to melt on top of them. It’s incredibly delicious! Everyone loved it, especially The Hubs! This was better than any steakhouse recipe we’ve ever had. So delicious! This is something special I started doing for my wife. 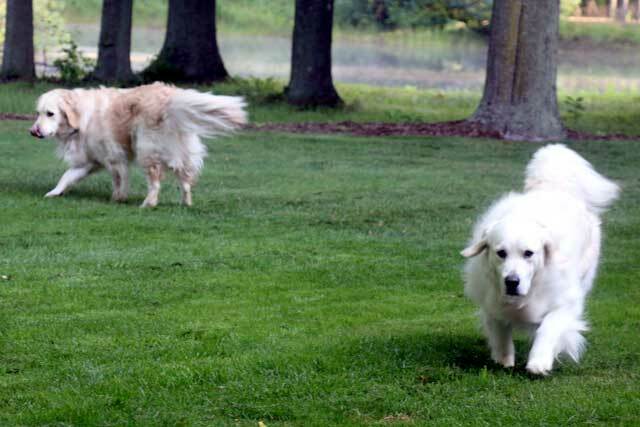 She is a blue cheese and garlic hound. But I love it too. Yes, I do it all the time. Cut into serving size pats. Good frozen for 2-3 months. How much is a serving as far as ounces or grams? I see there are 12 servings but I can’t find what is considered a serving. Thank you. 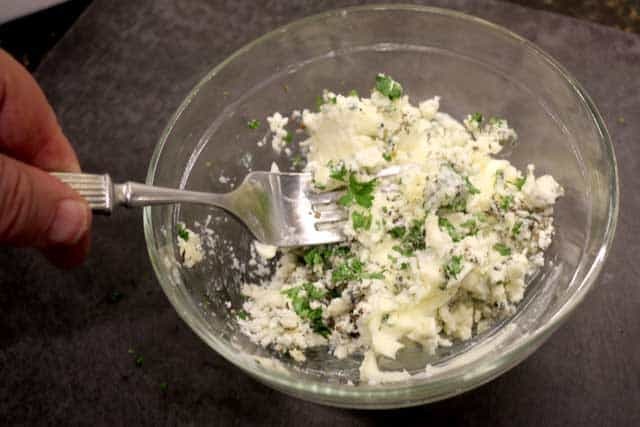 Total recipe makes 1 cup in volume (about 6 oz of weight since the blue cheese crumbles are less dense). Think of a 1 tablespoon pat of butter. It will be about 1/3 larger and weight about 1/2 oz. So a good size chunk. Made this today for my bacon wraped filet. What a treat, thanks much for posting.